Download text and hi-res images here. 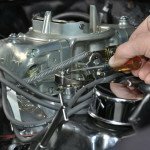 The cardinal rule of carburetor tuning is Ignition First. Once the static ignition setting and the ignition advancing mechanism in the distributor is correct, the air-fuel mixture can be tuned for full power and fuel efficiency. 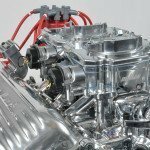 High-performance carburetors, intake manifolds, cylinder heads, camshafts, and other tuning components are all dependent upon correct ignition timing; if the spark is not delivered at the proper time to the combustion chamber, the quest for optimum power or economy is impaired. But the distributor has vanished! Tuning contemporary hot rods involves electronics and computer software. Sensors abound. They sense Manifold Absolute Pressure, Mass Air Flow, crankshaft position and so on. They report to an ECU (engine control unit) that constantly ascertains all the variables and tells each spark plug when to fire. Where there was once a distributor, multiple coils now exist, often one on each spark plug. Still, what a joy it is to understand the psychology of the hot rodder who lusts for a carburetor and a distributor. And, ironically, older vehicles can be simpler to tune. 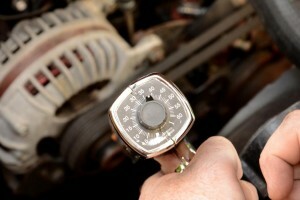 They require no fancy equipment or computer knowledge, often just a timing light, a screwdriver and a few wrenches. 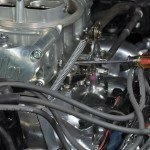 Brief background on points-and-coil ignition Before sophisticated electronic management systems arrived, we used the points-and-coil ignition system that first appeared on the 1910 Cadillac. A distributor was employed to determine when each spark plug should fire. 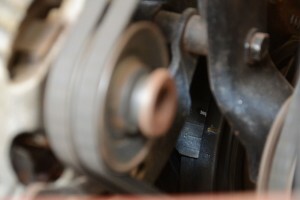 An engine-driven mechanical cam in the distributor rotating at camshaft speed operated a set of breaker points. 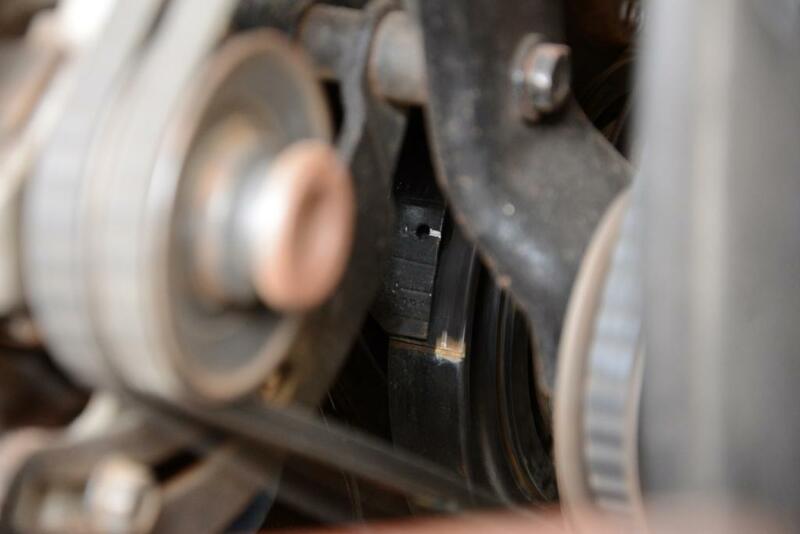 The points switched electrical current to the coil which converted it to high voltage required to fire spark plugs. The high voltage was delivered from the coil to the center of the distributor cap via a high-voltage wire. Inside the cap there are small metal tabs, one to serve each spark plug. A rotor mounted on the upper end of the mechanical cam and functioning within the distributor cap routes the high-voltage impulses to the correct spark plug. A condenser has the dual function of extending the life of the points by quenching the arc across the points and forming a resonant circuit with the coil that boosts peak voltage. The rotor is connected through the high-voltage coil to the battery, and the small metal tabs in the distributor cap are connected via spark plug wires to the spark plugs. 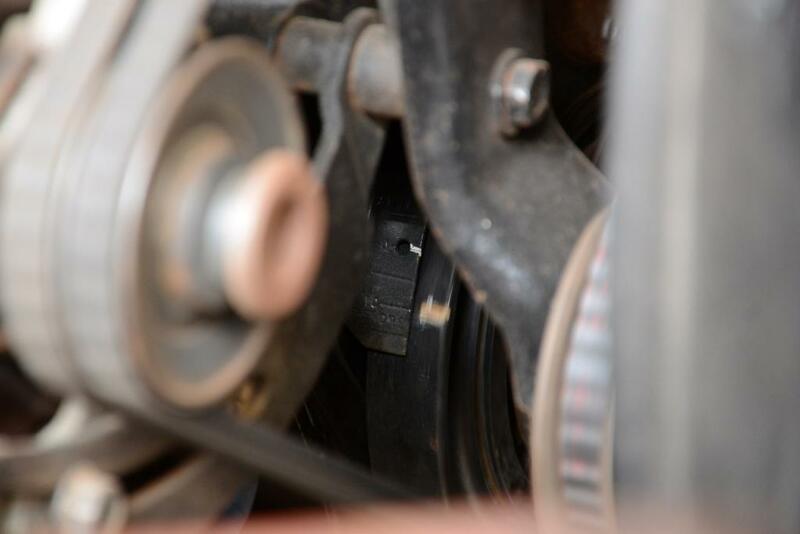 As the rotor spins, the current jumps across the tiny gap to each of the small metal tabs, completing the electrical circuit and sending short-duration, high-voltage currents to each spark plug on time. Ignition timing is affected by a host of elements including fuel type, mixture strength, combustion chamber shape, compression ratio, temperature and humidity. Furthermore, the ignition is always timed to fire the spark plug before the piston reaches Top Dead Center (TDC) in the cylinder. Firing before TDC is necessary because of the time it takes for the flame front to ignite the air-fuel mixture in the cylinder. Using a standard timing light (a non-dial-back type) connected to the number 1 cylinder and to both battery terminals and with the engine running on idle this engine is firing about 20 degrees before TDC. 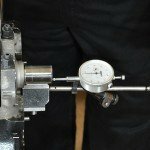 This ignition timing event is known as the static or initial timing and is a good starting point for high performance engines, particularly those with aggressive camshafts. Firing at 10 degrees before TDC is a good static ignition setting for a mildly modified engine. Firing at 5 degrees before TDC is a typical static ignition setting for a stock engine. Firing at TDC or just after, as shown here, will probably cause the engine to stop. 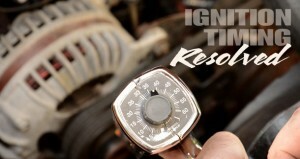 Engines, particularly high-performance engines are allergic to retarded ignition timing. Because of the time required to ignite the air-fuel mixture in the cylinder they need correctly advanced ignition timing to run properly. When you combine static or initial timing with progressive timing the result is total timing. Static timing can vary from as little as 8 degrees before TDC to over 40 degrees depending upon the engine. Tuning the static or initial timing is achieved by simply twisting the distributor body in relation to the rotor. Consequently, either the points or an electronic pickup will be triggered earlier or later. Progressive spark advance is conducted by either mechanical means or by vacuum or both. Its function is to increase ignition timing beyond that of the static setting. As engine speeds increase the spark is required to fire earlier because there is less time for the air-fuel mixture to burn. Mechanical spark advance mechanisms consist of weights on springs that are hurled outwards under centrifugal force within the distributor. As engine speeds increase, the weights progressively rotate on a wider radius, advancing the rotor relative to the cap and consequently advancing the ignition timing. Vacuum advance, on the other hand, accelerates the ignition timing by responding to low pressure in the intake manifold. The task for the engine tuner, therefore, is to fire the spark at exactly the right time throughout rev range. 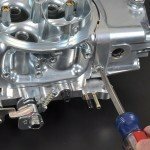 Tuning the vacuum advance mechanism is achieved by use of an adjustable vacuum advance or changing the location where it senses the vacuum in the intake manifold. Tuning the mechanical advance mechanism is accomplished by replacing the springs or weights or both. Often highly tuned engines, those with high performance camshafts, cylinder heads, and intake manifolds exhibit a lazy response or, worse, hesitate under acceleration or die at idle. The solution is to increase the static timing and decrease the progressive timing (mechanical or vacuum) thereby limiting excessive total timing at high engine speeds. Carburetor tuners regard this as their most abiding problem but one that is easily cured by distributor modifications. 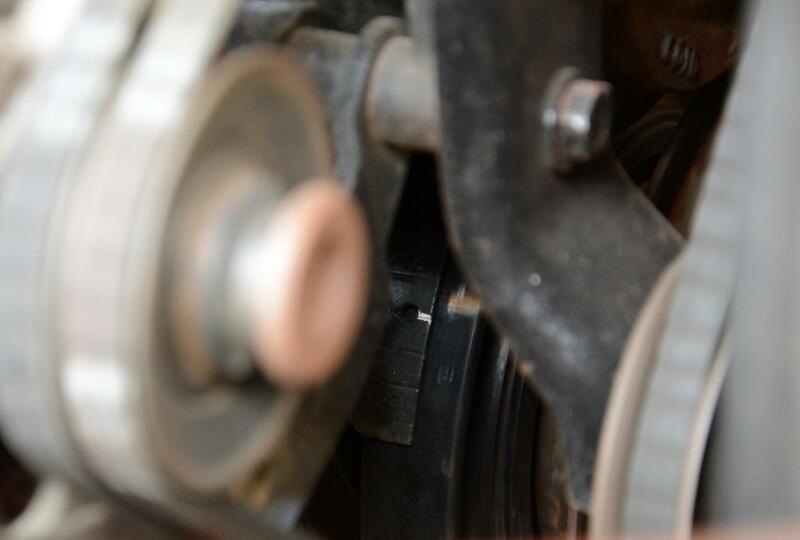 Using a dial-back-style timing light, you adjust the dial until the line on the crankshaft balancer aligns with the TDC mark on the tab. Thus, at idle the number on the dial would represent your initial timing. Total timing is determined similarly, except the engine speed is increased, usually to 2,500-3,000rpm at which speed the weights and springs will have moved to their maximum advance position. The advantage of the dial-back-style timing light becomes clear when determining total timing. In this example total timing is recorded at 38 degrees before TDC. With the standard non-dial-back timing light, 38 degrees will be a far distance from the tab and requires some form of measuring. Demon wants to tell you how to tune carburetors—in minutes!